Ok, the WDR can find out and restore my hidden files/folder to another different drive. BUT how to delete the old one? At Wise Care 365 you have Disk Eraser to erase the free space of an partition and File Shredder to prevent restore of files you want. Maybe you can suggest them to add Delete to next versions of WDR. Your suggestion has been submitted to our tech team for further improvement. Thanks. I updated my Wise Folder Hider and now I can't see the hidden folder. I can enter it with same password, but list is empty. I uninstalled and re-install a couple of times and also tried the WDR, but all didn't work. 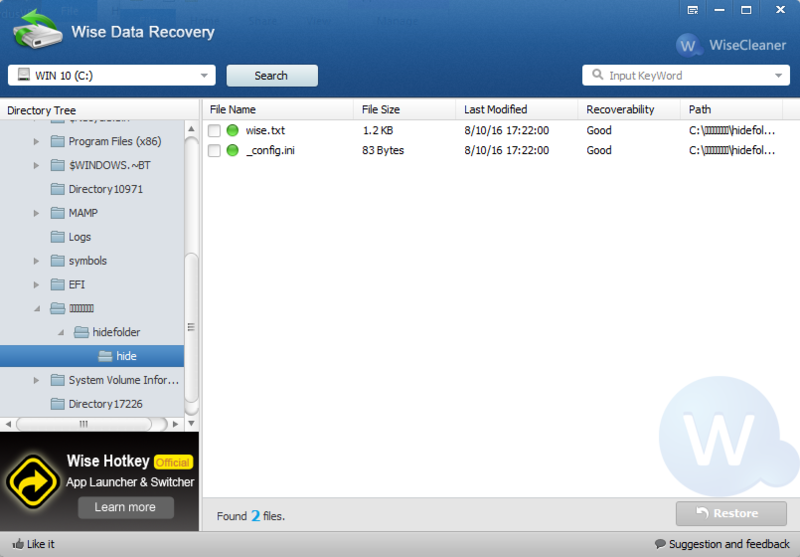 Sorry but can't delete those hidden folders although i could recover them with WDR. Isn't there any way to reclaim that space (i found out that if you don't delete those folders then wise folder hider can't hide any more folders on that partition,see below )? I've the latest version and its a shame the developers haven't fixed this bug since from earlier versions. Found a way to delete those weird folders using MultiCommander. 3.Navigate inside the "..." folder till you reach the hidden folder . 4.Grant yourself full permission via the security menu under Tools. en, I will try it. I've just installed Folder Hider and already a file has completely disappeared. I downloaded the WDR file as suggested but when I unpack it and run it it says it can't open the language file and please reinstall. 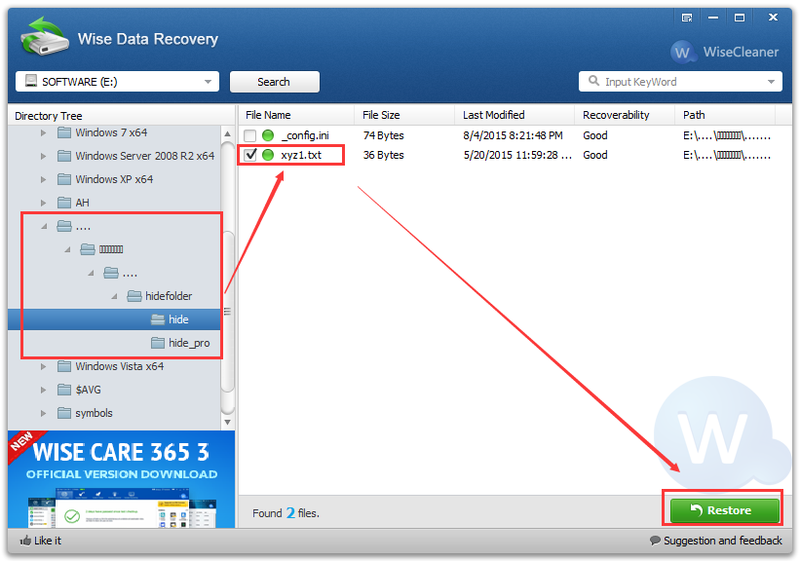 If I can't open WDR how can I retrieve my missing file? Edited ..... after 4 or 5 attempts I finally managed to run the WDR file but the missing file does not appear in the "hide" folder. Where has it gone? Perhaps I did something wrong. I had opened the file so it was showing as "visible" in the Folder Hider window and I clicked on "password" to lock it, and that's when it simply disappeared. If you shouldn't try to add a password to a visible file, perhaps the program should prevent you from doing this. Can I get my file back? 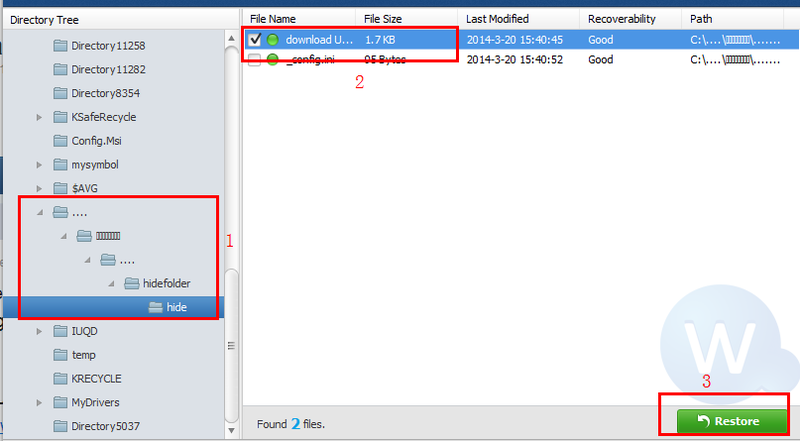 I follow your operation, but the hidden files is still displayed in Wise Folder Hider. 4, If you cannot find "...." folder. try to search your files in root directory.It may be unhide. Did you do something before this problem? Yes!!! I to have a same problem....please help me....i need my folder.....i hidden my picture folder in libraries....now try to open that....but its showing that same error mgs. 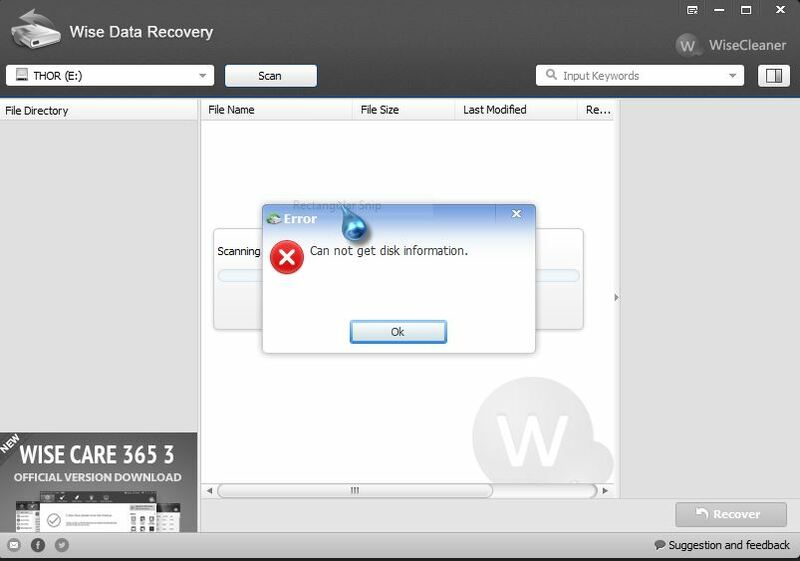 I have the latest version of Wise Data Recovery 3.71.195 and when trying to open my 3 TB Seagate Expansion Desk (External USB Drive) I'm getting "Error: Can not get disk information" I had successfully recovered files lost using Wise Folder Hider with this same drive before. When I upgraded my OS to Windows 7 Professional SP1 64-bit and had to install a new Asus motherboard. Wise Folder Hider doesn't remember the drive. If I could get Wise Data Recovery to find the }}}} folders/files like before I could rescue 1 TB of hidden data. Please download the following tool - wise disk cleaner, and open Advanced Cleaner tab to check whether it get your disk info. If not, please open %appdata%\Wise Disk Cleaner\ whether you can see the file - errorlog.txt, then send it to me. Sorry for the delay in responding! I downloaded the latest versions (of all 3 Wise products here) and Wise Disk Cleaner and it DOES see my Seagate Drive E: as does Wise Folder Hider. Only Wise Data Recovery cannot see my E: drive (to recoernal.e Extver my lost WFH files). I used Recuva to get back a few but Wise Data Recovery does a much better job of recovering . I've used it successfully in the past! There is no errorlog with Wise Disk Cleaner because it CAN see my Seagatate External Drive. I'm confused still why it used to work and now with the same drive and newest versions it can't!? Can you use the Advanced Cleaner of wise disk cleaner to scan and clean your Seagate Drive E?